Lettuce wraps are the perfect summer food. They’re light, you can eat them with your hand, and the lettuce keeps your mouth cool. My curry chicken salad recipe requires minimal time at the stove (like 30 seconds), especially if you use rotisserie chicken. That means no standing over a hot stove while it’s 90 degrees outside. Plus it’s a lot healthier than your traditional mayonnaise based chicken salads. 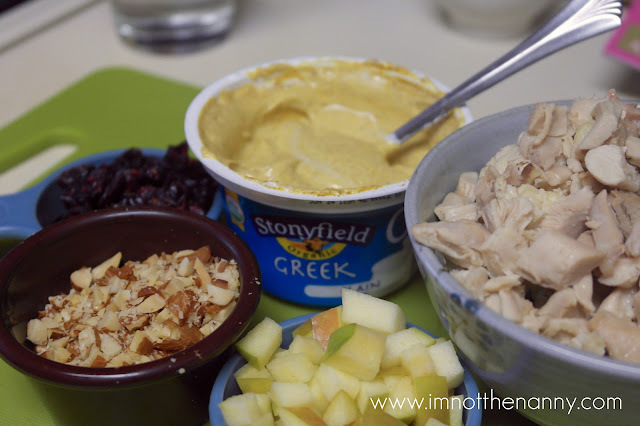 As part of National Fresh Fruit and Vegetables Month, Stonyfield sent me some coupons for their Greek yogurt and for Earthbound Farms organic products and challenged me to create a fun recipe. 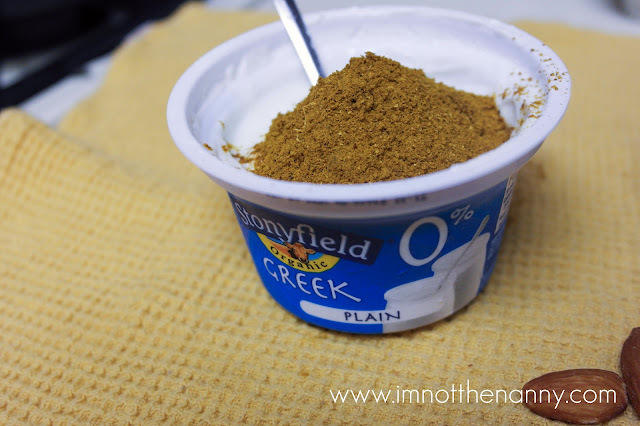 I’ve tried other Greek yogurts and Stonyfield’s is the creamiest. The others were a bit too chalky for my taste. As you know I’m a fan of substituting yogurt for sour cream or mayonnaise. I chose romaine lettuce because its crunch would work well with the softer texture of the chicken salad. However Earthbound Farms has some tasty looking lettuce mixes, like the zen blend. I’m definitely going to try them out. I love curry in my food, not just for the heat but for the flavor. Even if you don’t like spicy food, give this recipe a try. The yogurt tempers the spiciness of the curry without diluting the flavor. 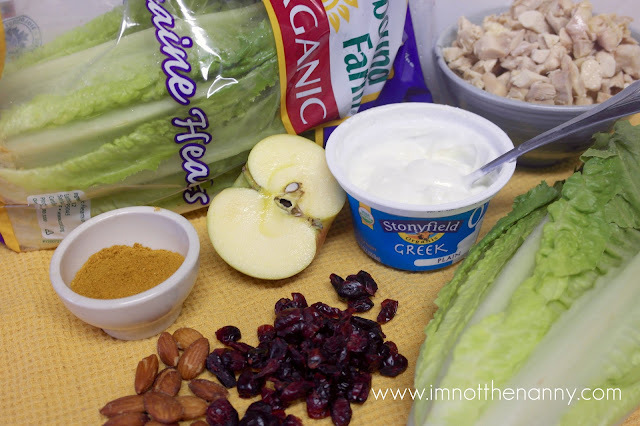 If you have time, make the salad the night before to let the curry permeate the yogurt and chicken. It’s not only great in lettuce wraps, but on bread, atop crackers, and in wraps. If you bring it to a picnic or potluck, make sure to keep it chilled since there’s yogurt in it. Heat a dry skillet on medium, toast the curry powder until it smokes, about 30-45 seconds. Remove from heat and add to yogurt. Stir into yogurt until completely combined. It should turn a pretty golden color. Set aside to let the flavors meld while you prep the other ingredients. Dice the apples and chicken into uniform size, about 1/2 inch to 3/4 inch. In a medium bowl, combine all the ingredients (except lettuce), including the curry yogurt. Stir until well mixed. Season with salt and pepper to taste. Break romaine lettuce hearts into separate leaves and cut off the bottom white stem. Spoon curry chicken salad into the middle of the lettuce leaf, roll up and eat. Salad can me made the day before and tastes better the next day! *Adjust the curry powder to your preferred level of spiciness.